I had a external light bulb in series with my previous safety transformer to limit the output/short circuit current. This gave the problem that sometimes a bulb would fall on the ground with changing it. So I decided to make a new version with the light bulbs inside. 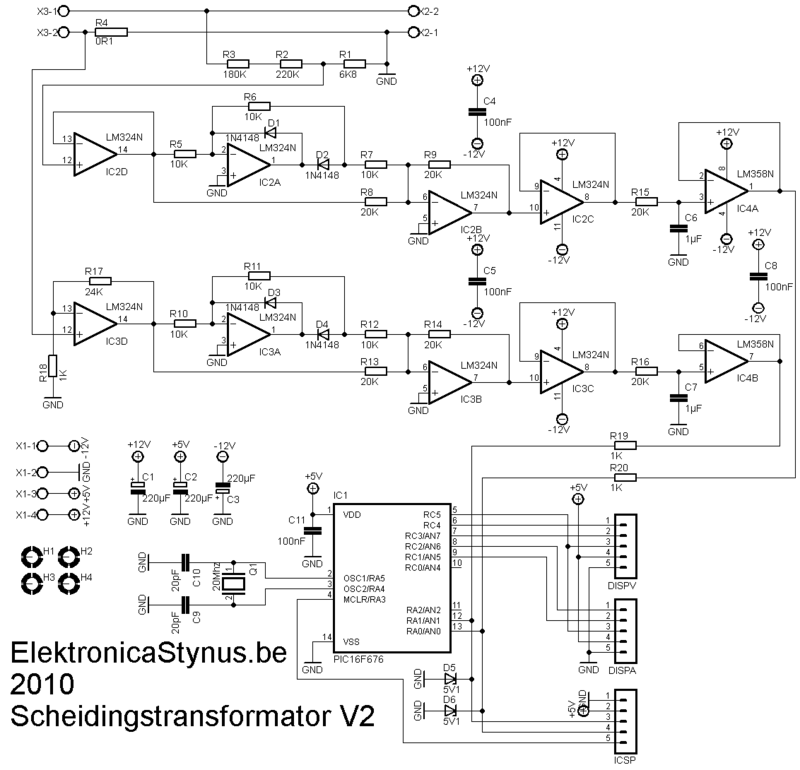 The previous version had a 140VA transformer and sometimes that was not enough. So I build a new one with a 300VA transformer. This time I wanted to put a voltage and current meter in it. I could just buy them, but where is the fun in that? So I made them myself. 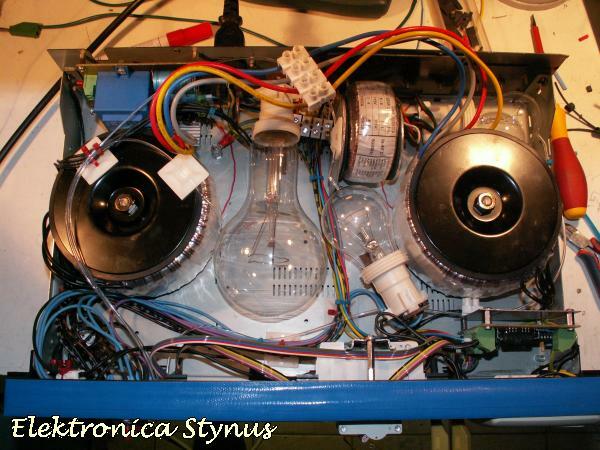 The voltage is lowered by a voltage divider, then rectified with a opamp precision rectifier. Then it is levelled by a RC filter which sends it in a AD converter. The current is measured with a 0,1 Ohm series resistor. Because off the current there is a voltage drop across the resistor that is proportional to the current. 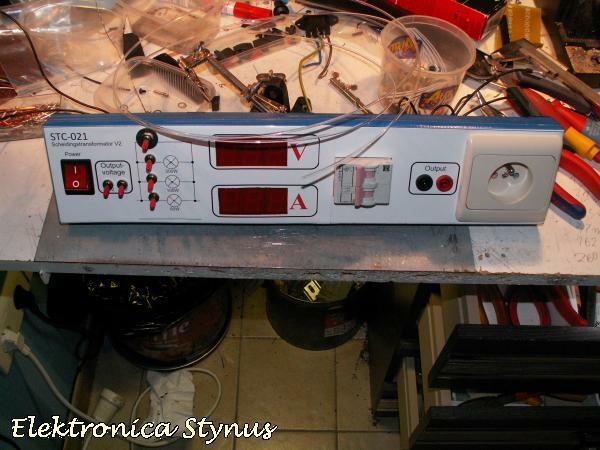 That voltage is amplified an rectified and let to the ad converter in the pic. The pic has to drive 6 7-segment displays. To save IO pins to do this I have decided to make a circuit with 2x 74HC595 ic’s. Now it takes only 3 pins per display, so 6 pins in total. 1 of the 2 74HC595 ic’s selects witch 7 segment display is on, the other one drives the digits. To indicate witch lights are burning I made 3 holes in the front and let some optic fiber from there to the light bulbs. 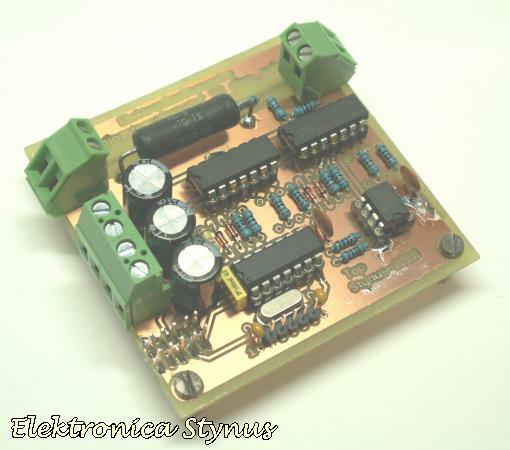 To power these 3 pcb’s I made a separate power supply pcb. 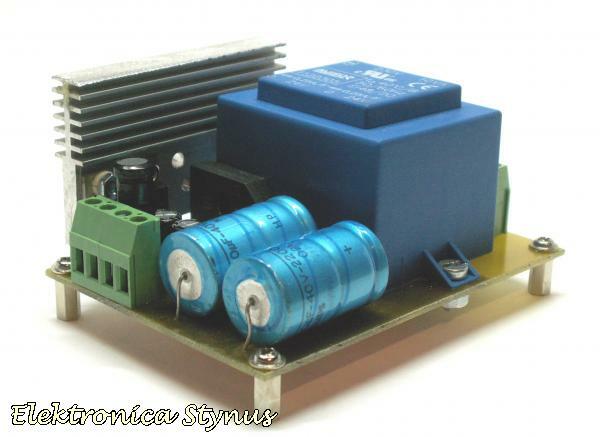 It delivers +12V, -12V and +5V. I used a transformer I had lying around, this transformer outputted 2*24V. 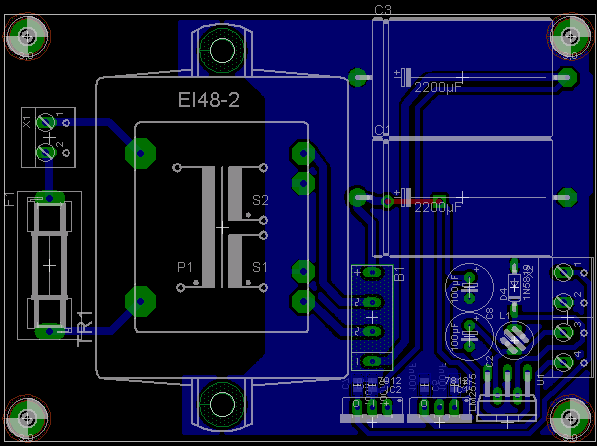 This has the disadvantage that the 5V regulator gets very hot if I use a linear one. So I decided to use a switching one. As you can read above, the current is limited by setting a light bulbs in series with the load. I have put 3 light bulbs in it, via 3 switches the bulbs can be selected. A forth switch can bypass the bulbs. 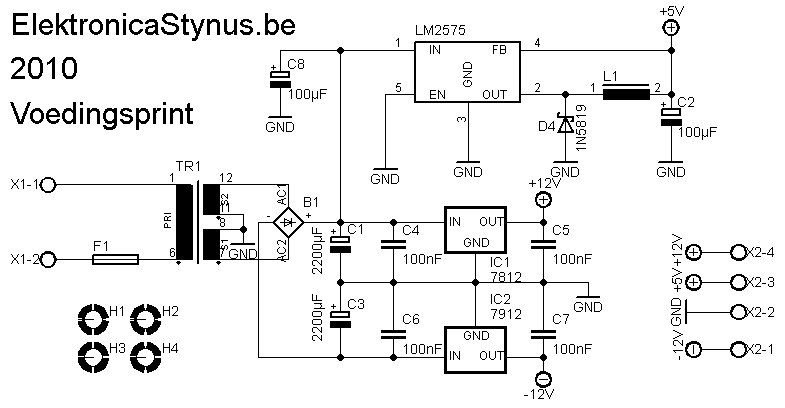 To limit the output current then and switch the output on/off I used a 2A circuit breaker. If you put 2 transformers “back to back” then you lose some voltage at the output. Therefore I’ve put a 60VA transformer that can put 15V on or of the output. For the output I used 2 safety plugs and a wall socket. 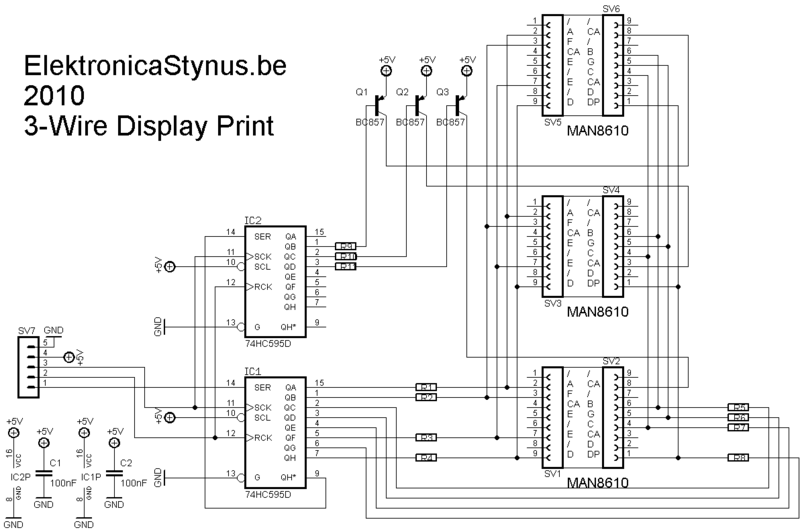 After finishing the dummyload project, I remembered that this project uses the same display pcb’s. Therefore I could reuse most of the code. So I finished this project as well. 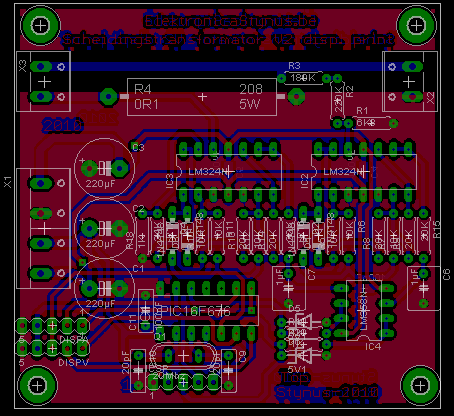 The pic in the project is now a PIC16F1825 which operates at 32Mhz.